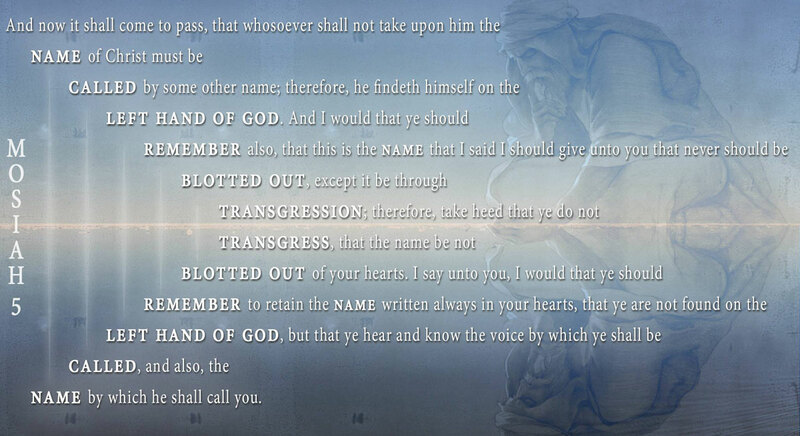 This is the name that I said I should give unto you that never should be blotted out, except it be through transgression; therefore, take heed that ye do not transgress, that the name be not blotted out of your hearts. I say unto you, I would that ye should remember to retain the name written always in your hearts, that ye are not found on the left hand of God. Thanks to the work of scholars like John W. Welch, many people are aware of the idea that chiasmus appears in the Book of Mormon. However, if one assumes that the Book of Mormon was written in another language and translated into English, would one expect that structures like chiasmus would survive translation? Chiastic patterns do survive translation, but not all the time. In fact, one reason it is unlikely Joseph Smith was aware of chiasmus is because the pattern is sometimes less obvious in the King James translation than in the original Hebrew or Greek. Similarly, Allen J. Christenson, a scholar of Mayan literature, found it difficult to preserve chiastic and other native literary structures in his standard translation of the Popol Vuh, compelling him to do a second translation that slavishly follows the native syntax in order to preserve the literary qualities of the text. Still, chiasmus and other forms of parallelism can and do survive translation into other languages. Chiasms like those found in Mark 2:27, for example, are evident even in translation. Indeed, as is not the case with many poetical features such as rhyme or meter, chiasm and other forms of parallelism may be the most likely to survive translation. In the Greek translation of the Old Testament, called the Septuagint, the parallels are just about as obvious in the Greek translation as they were in the original Hebrew. In fact, sometimes they were even clearer in Greek than in Hebrew. Many skilled translators today make efforts to preserve chiasms and other structural features of texts when rendering them into modern languages. Translation impacts questions of chiasmus in more than one way, however. Just as some patterns can be lost in translation, it is possible that others are actually the product of translation. The distribution of chiasmus and other parallel patterns throughout the text, however, does not appear to be random—as would be expected if chiasms were the accidental product of Joseph’s translation efforts. For example, Welch has noted that Helaman through Moroni has fewer chiasms than the rest of the Book of Mormon. Carl Cranny has more recently documented how the presence and absence of chiasmus and other forms of parallelism follows the expected patterns of a genuinely ancient document. If chiasmus were just a result of the translation process, this would not be the case, since Joseph Smith translated the entire book. Therefore, it is unlikely that chiasmus in the Book of Mormon was a result of translation, but was actually something on the plates themselves that survived the translation process. Evidently, his translation was consistent. Each time a word appeared within a given framework, it seems to have been rendered by the same English word. Otherwise, structures such as Mosiah 5:10–12, Alma 41:13–15, and others would not have survived through the translation process. … [I]n many cases, it is possible to see that an internally consistent result was produced in the English text, presumably by virtue of a relatively literal and consistent method of translation from the ancient record. The realization that chiasmus does not always survive translation, however, is also important. Welch lamented, “Of course, it is impossible to know how many other parallelisms or other literary features might have been lost in the translation process.” This understanding should make us keenly aware of the limitations we face in studying a translated text, like the Book of Mormon, from a literary perspective. Many elements of ancient texts do not survive translation very well, meaning that we are unable to fully appreciate some of the subtle craftsmanship of the text. While we may regret the likely loss of some of the literary structure and beauty of the Book of Mormon due to translation, this should not detract from our appreciation of the hundreds of chiasms and other poetic parallelisms that did survive and are available for us to study. In fact, to the contrary: it should deepen our appreciation. The survival of chiasmus in the English translation of the Book of Mormon gives us a window into the past and allows modern readers to experience the literary artistry of the ancients almost as though they were reading those texts alongside those ancient writers and in their original languages. Being able to see how these authors used creative patterns to express their ideas allows readers to better relate to them, even if they may, at times, seem far removed from our own time and culture. Moments like these allow the reader to connect with these ancient authors in new and meaningful ways. In addition, the preservation of chiasmus in translation allows us to understand the text in a way similar to the way the ancient authors would have understood it. This allows the message of the Book of Mormon to come through more clearly and have an impact on us hundreds of years after the text was first written. Brant A. Gardner, The Gift and Power: Translating the Book of Mormon (Salt Lake City, UT: Greg Kofford, 2011), 197–204, 239–240, 309–310. John W. Welch, “Chiasmus in the Book of Mormon,” in Chiasmus in Antiquity: Structures, Analyses, Exegesis, ed. John W. Welch (Hildesheim: Gerstenberg Verlag, 1981; reprint Provo, UT: Research Press, 1999), 198–210. See Robert F. Smith, “Assessing the Broad Impact of Jack Welch’s Discovery of Chiasmus in the Book of Mormon,” Journal of Book of Mormon Studies, 16, no. 2 (2007): 68–73. For a comprehensive list of proposed chiasms in the Book of Mormon, see “Chiasmus Index,” at Chiasmus Resources, online at chiasmusresources.org. John W. Welch, “Chiasmus in the Book of Mormon,” in Book of Mormon Authorship: New Light on Ancient Origens, ed. Noel B. Reynolds (Provo, UT: Religious Studies Center, 1982), 42, 51 n.3. For Christenson’s two translations, see Allen J. Christenson, trans., Popol Vuh: The Sacred Book of the Maya (Norman, OK: University of Oklahoma Press, 2007); Allen J. Christenson, trans., Popol Vuh: Literal Poetic Version (Norman, OK: University of Oklahoma Press, 2007). Not all examples of chiasmus and other poetic structures get lost in the free translation. In fact, many do survive—though they undergo some modification and are more obvious in the literal poetic translation. Gerhard Tauberschmidt, Secondary Parallelism: A Study of Translation Technique in LXX Proverbs (Atlanta, GA: Society of Biblical Literature, 2004), 12. Edward F. Campbell Jr., Ruth: A New Translation with Introduction and Commentary, Anchor Bible Commentary, Volume 7 (New York, NY: Doubleday, 1975), 62. Brant A. Gardner, The Gift and Power: Translating the Book of Mormon (Salt Lake City, UT: Greg Kofford, 2011), 309. Gardner, Gift and Power, 309. John W. Welch, “Chiasmus in the Book of Mormon,” in Chiasmus in Antiquity: Structures, Analyses, Exegesis, ed. John W. Welch (Hildesheim: Gerstenberg Verlag, 1981; reprint Provo, UT: Research Press, 1999), 208. For the extensive use of chiasmus in Mosiah 2–5, see Book of Mormon Central, “Why Did King Benjamin Use Poetic Parallels So Extensively? (Mosiah 5:11),” KnoWhy 83 (April 21, 2016). See Carl J. Cranney, “The Deliberate Use of Hebrew Parallelisms in the Book of Mormon,” Journal of Book of Mormon Studies 23 (2014): 140–165. See Gardner, Gift and Power, 197–204, 239–240. John W. Welch, “What Does Chiasmus in the Book of Mormon Prove?” in Book of Mormon Authorship Revisited: The Evidence for Ancient Origins, ed. Noel B. Reynolds (Provo, UT: FARMS, 1997), 220–221. Welch, “What Does Chiasmus in the Book of Mormon Prove?” 220. For more on how chiasmus shows the subtle craftsmanship of the Book of Mormon, see Book of Mormon Central, “Why Was Alma Converted? (Alma 36:21),” KnoWhy 144 (July 15, 2016). For an example of this, see Donald W. Parry, Poetic Parallelisms in the Book of Mormon: The Complete Text Reformatted (Provo, UT: Neal A. Maxwell Institute for Religious Scholarship, 2007). Altogether, Parry displays 1600 examples of 23 different forms of parallelism in the Book of Mormon. See Book of Mormon Central, “Why Was Chiasmus Used In Nephite Record Keeping? (Helaman 6:10),” KnoWhy 177 (August 31, 2016). Book of Mormon Central, “Why Does the Book of Ether Begin with Such a Long Genealogy? (Ether 1:16),” KnoWhy 235 (November 21, 2016). Book of Mormon Central, “Why Is The Presence Of Chiasmus In The Book Of Mormon Significant? (Mosiah 5:10–12),” KnoWhy 166 (August 16, 2016). This also helps to show how central Christ is to the message of the Book of Mormon. See Book of Mormon Central, “Why Did Nephi Use Chiasmus To Testify Of Christ? (2 Nephi 11:3),” KnoWhy 271 (February 6, 2017).